Fishing in the rushing Blue Creek or stocked Trout Pond will give you and your family a fun and unforgettable experience. The Trout Pond is only few feet away from the Blue Creek and only a short drive from our office. No fishing December 1st � March 1st. Would you like to take a look at our herb and vegetable gardens? Ask for an appointment with Dave, owner of Blue Creek Cabins and he will give you a tour and let you sample different herbs and vegetables. We also grow Shiitake mushrooms right by the Blue Creek. Take time and bring your whole family to explore our trails and the �Old bear cave� which is found along the Blue Creek. You will get to see local flora and fauna as you take a short stroll through the woods and breathe in some fresh mountain air! Staying at the Garden House immerses you and your loved ones in the full Blue Creek experience! Within a short walking distance you can be trout fishing, picking fresh vegetables in the garden or taking a hike on Old Bear Cave trail. Reserve our Event Hall for a family reunion party, church worship service, business meeting or any other event. 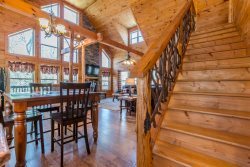 Enjoy the complete privacy that this property offers and the convenient location as it is only a short drive from our office and several of our deluxe cabins. Inquire about our wedding packages and schedule an appointment to receive a tour of the Outdoor Weddings settings and the Wedding Chapel. The Chapel features a private bedroom and bathroom where you can spend the night if you choose to do so.